The article I wrote for the online Journal of the American Revolution has appeared. “Niagara Falls: the grandest sight imaginable” is in the August issue and can be found here. I enjoyed doing it as it involved more research into primary sources—I had to include the observations of a few men in addition those of the women (which I already had as a result of my work on the book In the Words of Women). Do have a look. You might want to subscribe to this Journal which is relatively new; it has a number of interesting articles in each issue. I’m searching for another topic on which to write a piece. 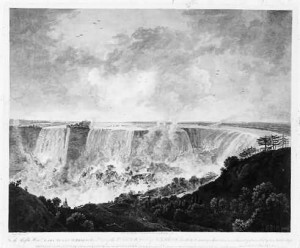 The illustration is a watercolor of Niagara Falls from the Canadian side painted by Elizabeth Posthuma Gwillim Graves Simcoe in 1791.
posted August 27th, 2015 by Janet, comments (0), CATEGORIES: Ashby, George,Izard, Ralph,Niagara Falls,Powell, Ann,Primary sources,Research,Schieffelin, Hannah Lawrence,Simcoe, Elizabeth,Weld, Isaac Jr.
Do check out the online Journal of the American Revolution. 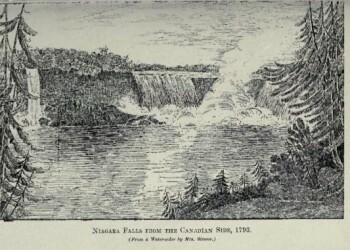 An article I wrote about Niagara Falls titled “The fall . . . is the grandest sight imaginable” will be published in the August edition. It includes descriptions of the Falls by several visitors, both men and women (among them Hannah Lawrence Schieffelin, Anne Powell, and Elizabeth Simcoe) who journeyed to see the cataract that was already famous in the eighteenth century. I’m sure you will find other items to pique your interest. Hannah Lawrence, whose Quaker family had remained in New York City during the British occupation, favored the patriots over the “unwelcome invaders.” (See previous post.) She especially deplored the conduct of British soldiers who frequented an area near Trinity Church where prostitutes offered their services. She penned this poem, anonymously, had it printed on broadsheets and dropped them on the streets in the neighborhood. This was a treasonous act and had she been identified as the author she might have hanged for it. The mansions of our dead profane? A herd of undistinguish’d things. That shrink beneath the power of Kings! To violate the sacred Tomb? Even wildest rage were virtue here. Oh arm! to vengeance, arm the skies. By thunder from the ethereal plains. And vindicate the hallow’d ground! Ironically, a British soldier by the name of Jacob Schieffelin was billeted at the Lawrence house. Hannah fell in love with him; they married and departed for Canada. Even though her father disapproved, relations between Hannah and her family were not severed. The Schieffelins returned to New York City after the Revolution and Jacob went into the drug business with Hannah’s brother. Schieffelin’s real estate interests extended to northern Manhattan where he, with his brothers-in-law, laid out a village, in the vicinity of what is today West 125th Street and Broadway, called Manhattanville. Streets were named for family members and St. Mary’s Episcopal Church was constructed there. Near the front door of the present church is the vault wherein lie Jacob and Hannah Schieffelin. The poem and portraits can be found HERE. 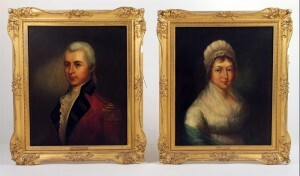 The portraits were up for auction in 2013; the buyer is unknown. For information about Jacob Schieffelin’s business activities consult this LINK. Also see Manhattanville. Address’d to a Canary Bird. From the Ills thy race endure. Ah! what woes await you there! Bears your new-fledged young away. Through the gloom a dismal day. From the inclement raging Sky? The needful shelter that you want. All those cruel Ills prevent. The poem is from Notebook of Poems by Matilda New York 1774, number I, in the Schieffelin Papers, Box 7, New York Public Library, Manuscripts. I proceeded … by slow and intricate windings up that rugged mountain, and contemplated the native wilderness of the scene through which we passed, till my ears were struck with the approaching sound of the falling torrent, and a sudden shower gave us to know that it could not be far distant, while innumberable isicles shook from the trees, on our heads, at every breath of wind, and were as quickly replaced by the constant succession of vapours condensing on the branches. This excerpt is from In the Words of Women Chapter 9, page 263. The image above dates from 1774, a few years before the Schieffelins’ visit. It is an engraving published in London by the artist Richard Wilson, based on a sketch made at the falls by a British artilleryman, Lt. Pierie, in 1768. It is part of the Charles Rand Penney Collection of images of Niagara Falls.